I bought these pants a few weeks ago and finally on Monday decided I’d get to work and hem them so they can be worn. I was in my sweats at the time and intended to get the hemming done in short order and wear the pants that day. Now, on Wednesday I still have one leg to un-pick. Unpicking is not so much fun, and commercially made clothes are particularly unpleasant to pull apart so I have a hard time sticking with the project. It was pure bad luck that this particular hem required removing any seams at all. 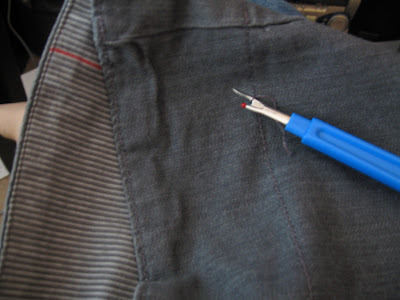 I think I’ll start checking for that before I buy pants since at 5’2″ I end up hemming nearly every pair I buy. Other than picking out a stitch or two when I find my hands free, I’ve been planning some more projects made from men’s shirts. I have a thrifted shirt along with an old one of the Mr’s that will each be a dress for Baby Girl, and of course, I still have Tiny’s blue Sunday Romper to do. I’m in the thinking phase on that one. Trying to figure out how to re-use the button placket without the little polo man ending up in the arm pit. The third aspect of that goal is that I don’t want re-using the button placket to end up being more work than it would have been just to make a new one. So I’ll keep thinking on it, ripping out stitches as I go along.